The Pragmatic Programmers classic is back! 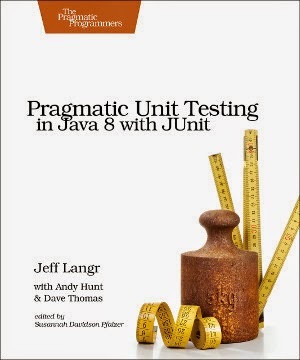 Freshly updated for modern software development, Pragmatic Unit Testing in Java 8 With JUnit teaches you how to write and run easily maintained unit tests in JUnit with confidence. You'll learn mnemonics to help you know what tests to write, how to remember all the boundary conditions, and what the qualities of a good test are. You'll see how unit tests can pay off by allowing you to keep your system code clean, and you'll learn how to handle the stuff that seems too tough to test. Pragmatic Unit Testing in Java 8 With JUnit steps you through all the important unit testing topics. If you've never written a unit test, you'll see screen shots from Eclipse, IntelliJ IDEA, and NetBeans that will help you get past the hard part--getting set up and started. How to craft your unit tests to minimize your effort in maintaining them. How to use unit tests to help keep your system clean. How to test the tough stuff. Memorable mnemonics to help you remember what's important when writing unit tests. How to help your team reap and sustain the benefits of unit testing. You won't just learn about unit testing in theory--you'll work through numerous code examples. When it comes to programming, hands-on is the only way to learn!